Currie Chieftains will field a host of rising stars for their game against title holders Ayr at Malleny Park when the BT Premiership play-off semi-finals take place tomorrow (kick-off 3pm), with a Capital presence in both matches. Already this season, Luke Crosbie and Charlie Shiel have graduated to the professional ranks after signing up with Edinburgh Rugby. Several others are on the radar of Scottish Rugby’s full-time outfits, with Thomas Gordon looking likely to be next to make the step up. 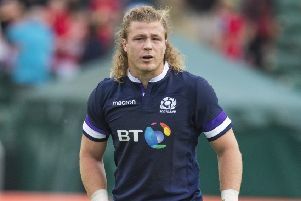 Crosbie is released by Edinburgh, while his fellow pros, Ratu Tagive and Richie Vernon, have been made available by Glasgow Warriors and both start. Among the others lining up for the hosts tomorrow is Harvey Elms, who has been with the Scotland sevens squad this season. He is at full-back, with Ben Robbins – scorer of a hat-trick against Heriot’s three weeks ago – switching to the wing. The teams have had three tight meetings already this season, with each having won away from home in the league, while Ayr took the honours in the BT Cup clash at Millbrae. Chieftains have failed to make it past this stage of the competition in all three years since the introduction of the play-off phase, and coach Ben Cairns is conscious of the size of the task that awaits his men if they are to progress this time. “Ayr are a side who have a track record of performing in big games and have already beaten us on our own patch this season, so I am sure they will travel with every belief they can make another play-off final,” he said. “For us, it’s great to be in another play-off semi-final and even better to be at Malleny but the aim is to make history and reach our first play-off final. Discipline will be key in what promises to be a hard-fought tie, and the hosts have underlined their strength in that department by having the fewest yellow cards of all ten top-flight teams during the regular phase of the league programme. The other semi-final sees Watsonians head for Melrose in the first of two clashes on consecutive Saturdays between the sides – they will also meet at Myreside on BT Cup duty next week. Each of the teams go into tomorrow’s encounter on the back of a defeat – Sonians having gone down against Ayr last time out while Melrose lost to Hawick last Saturday. Steve Lawrie, in his first season at the helm, has seen his men rally from a slow start to the campaign to rise steadily up the table and clinch fourth spot after the regular programme. Melrose finished the season on top of the table and were leading try scorers, followed by Sonians, so a good open contest is in prospect tomorrow. “Melrose away in the play-offs is certainly no easy task,” conceded Lawrie. Elsewhere, Edinburgh Accies will be looking to bounce back from last weekend’s defeat when they welcome Kelso to Raeburn Place in BT National Division One. The Capital outfit lost away to Jed-Forest, their promotion rivals, ensuring an intriguing final four matches as the duo battle it out to decide which of them goes up as champions and which will go head-to-head with Glasgow Hawks in the promotion/relegation play-off match. At the other end of the table, Stewart’s Melville will be relegated if they fail to beat Gala at Inverleith.